The Natural Hazards Partnership’s Daily Hazard Assessment is an ‘at a glance’ overview of potential natural hazards and health implications that could affect the UK over the next 5 days. It provides a hazards summary to help increase UK’s ability to respond to, and be prepared for multi-hazard events. 21 natural hazards are included in the Daily Hazard Assessment, they are all assessed and the relevant Colour State determined using the Hazard Matrix. The document contains links to more detailed information about each of the highlighted hazards, helping users to gain more value from existing services and thereby speeding up decision making and response. Consistent hazard matrices to aid assessment and understanding. Hazard Matrix risk colours are consistent across all natural hazards. Risks and assessments are mapped onto our Science Notes. Hazard leads and contact details are established and tested. 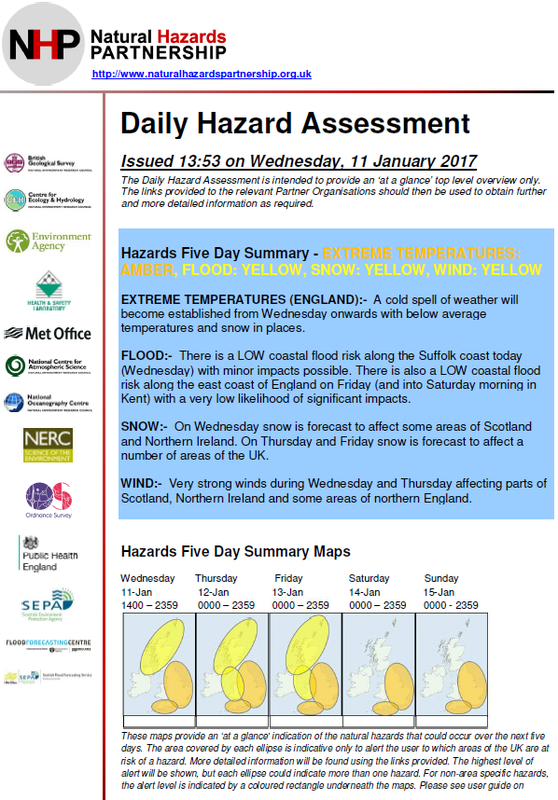 The Daily Hazard Assessment is delivered through the Met Office Hazard Manager and Resilience Direct. Met Office Hazard Manager allows users to choose how they receive the product, delivery and hazard notification options. This service is available to all Category 1 and 2 Responders. Resilience Direct is available to those responsible for, and involved in, emergency planning, response and recovery. The Daily Hazard Assessment can by found under Planning -> Working Groups -> Natural Hazards Partnership. The site also contains a Daily Hazard Assessment archive from September 2015.